Peter M. Good | Caldwell & Kearns, P.C. 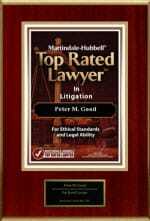 Peter M. Good is a seasoned legal professional who combines over twenty seven years of varied legal experience with a keen understanding of business imperatives and expectations. His practice focuses primarily on the litigation of commercial disputes, labor and employment, administrative law, and construction matters. Mr. Good provides counsel to senior management and government officials and formulates, reviews and implements legal strategy, with a particular emphasis on the litigation of complex commercial disputes, labor and employment matters and professional licensure work. He has successfully tried more than fifty cases including jury and bench trials in state and federal courts and argued more than fifteen appeals before the Pennsylvania Commonwealth, Superior, and Supreme Courts. He also has extensive experience in the arbitration and mediation of commercial disputes.